A recent historical overview would indicate just how confused things are, which doesn’t augur well for a ‘leading power’. 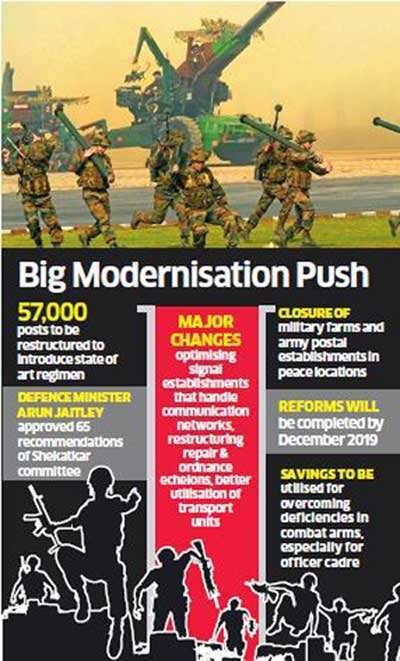 The initial flavor of the debate in the decades following the Group of Ministers’ report, the Kargil Review Committee report, and the Naresh Chandra Committee report focussed on a restructuring of higher defence organisation as the first step. This was intended to improve synergy among different tools of statecraft (bureaucracy, military, research and development, intelligence, internal security mechanisms, and more). When very little traction was seen in converting this into structural changes within the Ministry of Defence, and the sharing of expertise, the debate shifted to the second tier of reform in the operational realm. This has unfortunately pitted the three services against one another in a series of turf wars that have ranged from control over space to control over cyber and special forces. Theatre commands are seen as better for pooling resources and improving efficiency. Air force doesn’t have enough resources — fighter squadrons, mid-air refuelers and AWACS — to allocate them dedicatedly to different theatre commanders. In the heat of the battle, differences between the two services will inevitably crop up and that can very seriously affect our effectiveness. Hence, a theatre command with one commander is the need of the hour. Each command has specific strength according to their geographical need. The creation of large Naval and Army aviation arms demonstrates the IAF’s understanding that there is a need to complement its dwindling resources with air arms that could act as tactical responders at best till the IAF brings its cutting-edge skills into the area to act as a decisive sword-arm. With such a deep understanding of joint operations, it is impossible to imagine that the reservations expressed by the IAF leadership in supporting the creation of integrated theatre commands in isolation is tantamount to stonewalling. Dissection of the recently conducted exercise, Gaganshakti, would provide a quantitative analysis of this assertion. The main apprehensions of the IAF leadership not only revolve around how best to exploit its dwindling offensive resources if they are hived off to multiple theatre commands, but also how the limited availability of enabling equipment and platforms (AWACS, refuelers, electronic warfare platforms and more) could seriously jeopardise operations even in a single-adversary limited conflict. This conflict could involve up to three of the proposed theatre commands, including the Indian Navy. India’s armed forces have little experience in training, staffing and exercising Joint Task Forces based on at least a division-sized land component. Creation of three division-sized task forces for operations in varied terrain, including out-of-area contingency operations, could be mulled over. These would be commanded by an Army, Navy and Air Force three-star officer, respectively, reporting to the Chairman of the Chief of Staffs Committee. This could offer real lessons in integration. A Committee of Experts (CoE) was constituted by Ministry of Defence under the chairmanship DB Shekatkar to recommend measures to enhance combat capability and rebalance defence expenditure of the armed forces. The Report was taken up by the Ministry of Defence to frame key action points and roadmap for implementation. Along with these turf wars has been an out-of-the-box proposition that a bottom-up approach may be the answer to India’s quest for integration. Historical evidence of military reform (in Prussia, the U.S., the U.K., France and now China) shows that successful reform has always been driven by either a multipronged and simultaneous approach at all levels, or a sequential one beginning at the top. Any other approach that leaves the bottom and the top unattended is fraught with risk.